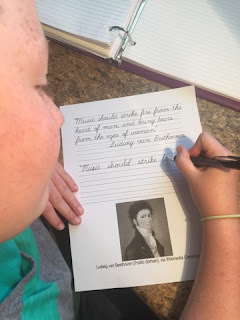 As homeschool moms sometimes we have to get creative in our kids school work. The Lifetime Membership from Homeschool Copywork is one product that was created because Amy Blevins wanted copywork pages for her own six homeschooled children. Copywork has so many benefits for our children. Not only does it help them have nice hand writing and memorization, it also helps the child to see how sentences are structured including grammar, letter placement, and capital letters. It can also be used for dictation to help the child write properly what they hear. Homeschool Copywork offers a Lifetime Membership and a Yearly Membership. I think those are self explanatory. The Lifetime lasts forever and the Yearly is for one year. There is copywork for high school, middle school, early and upper elementary levels covering a variety of topics. There are also some notebooking pages and pictures to color. You can navigate the site by choosing the appropriate grade level for your kids. Since my kids are older I started looking in the junior high-high school section first. There is copywork for composers, artists, scripture, famous poets, character building, holidays, hymns studies, and even Dragons of the Bible. Upper and Early Elementary cover a lot of the same topics plus things younger kids love or need like the alphabet and transportation. Some of the copywork could be used with different age groups. The same passage is provided on several different pages but some are in print and some are in cursive. I had my girls start with Beethoven Quotes from Composers. This ebook has 38 pages and can be used with students of multiple ages. 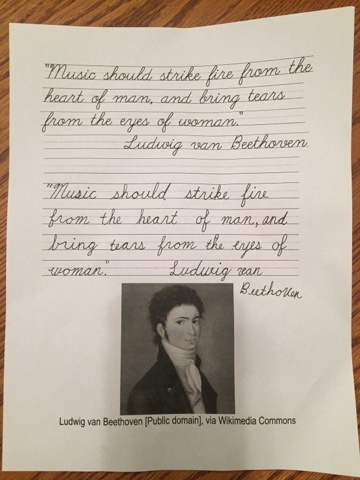 There are six quotes from Beethoven. The first section the words are dotted so children can trace the letters, then there is print letters, D'nealian letters, and cursive. In these all the quotes and blank spaces for the child to write is lined. Then there is a set of quotes in print and cursive that are not underlined. The section where the child writes is still lined just not the quote itself. Each quote has a colored picture of Beethoven starting when he was a boy and progressing through his life. We also used The Story of the Rainbow Copywork. This one is 19 pages long and uses Genesis 9:8-17 from the English Standard Version of the Bible. This passage is printed on the first page and then the next page Lynn Tolley tells us what the rainbow means to her. 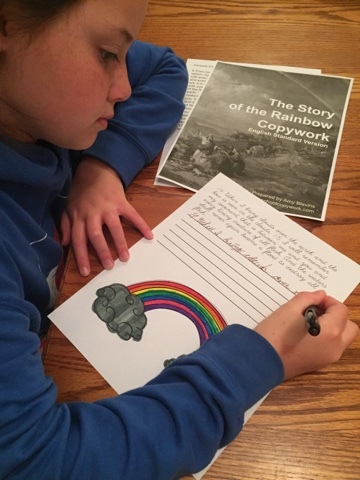 This copywork starts with three pages with just one word for younger children and then moves on to scripture quotes in print and cursive. Some of the pages have rainbows to color and others have colored photos. I really like for my girls to use some type of copywork every day. We don't spend very much time on it, but even a few minutes a day helps. When they are memorizing scripture I always have them write it to make it easier to remember. I have made copywork pages in the past or searched online for something that would work, but sometimes I get lazy and tell my kids to just use an index card or spiral bound notebook. They actually prefer having a copy page that is very pretty to look at and has a photo or a picture to color included on it. Having access to Homeschool Copywork makes it so much easier to give my girls what they like. The pages they have completed are very pretty and they look really nice in a notebook instead of random pieces of paper and index cards. Homeschool Copywork would be a great addition to any homeschool. There are so many topics included and I'm sure Amy Blevins will be adding more as she creates them for her own children. Make sure you head over to the Crew Blog to read which titles the other crew members used with their children.